Leah Wortham, J.D., Professional Responsibility and Bar Expert, Professor Emerita of Law, Columbus School of Law, The Catholic University of America (CUA), Washington, D.C., conducted the review and assessment of the Rules of Conduct for the Bar Members of the Ukrainian National Bar Association (approved by the Reporting and Elective Congress of Attorneys of Ukraine on June 9, 2017.) 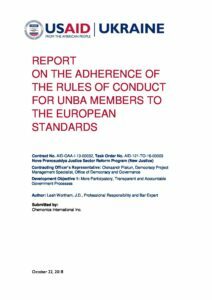 on the adherence to the European standards, specifically to the Council of Bars & Law Societies of Europe (CCBE) Charter of Core Principles and Code of Conduct. 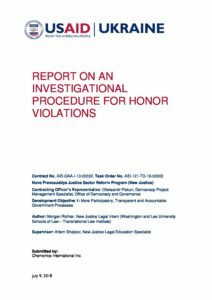 The Report on an Investigational Procedure for Honor Violations gives a framework on how a law school might investigate student conduct violations. From the designation of investigation members to the witness interviews, this report meticulously breaks down each component of a successful investigation. Example cases and outcomes are provided near the end, outlining for the reader different factor that should be considered when sentencing the accused. 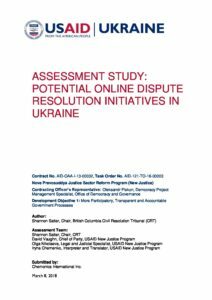 In September 2017, the USAID New Justice Program in Ukraine (New Justice) organized an Online Dispute Resolution (ODR) conference bringing together international ODR experts and Ukrainian judges, court administrators, lawyers, mediators, law students, and others. One of the conference recommendations was to incorporate ODR into the Ukrainian public justice system. 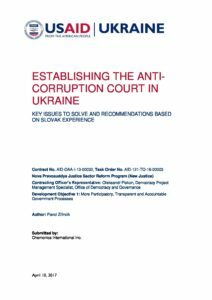 To further this recommendation, New Justice engaged the author, on a pro bono basis, to work as part of an assessment team to evaluate the potential for implementing a court-annexed ODR initiative in the Odessa or Lviv regions of Ukraine. 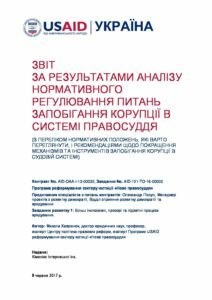 This Report presents the results of the analysis of the legal and regulatory framework in the field of prevention and combatting corruption in the judiciary of Ukraine, highlights the gaps and contradictions in legal provisions, as well as provides recommendations for their improvement. 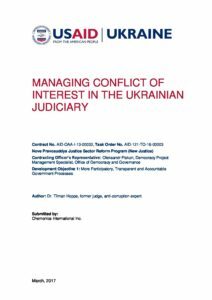 This Report reviews the entire chain of managing conflict of interest, starting with the definition of limits, procedures for managing conflict of interest, mechanisms of oversight (including complaints), and sanctions. It analyses the current framework from a regulatory perspective and by assessing the actual capacities of oversight bodies in preventing and detecting a conflict of interest. The focus of this assessment is on judges and on their judicial decisions, given that judicial decisions are the key function of the judiciary and only judges are responsible for them. In addition, the Report outlines conflict of interest aspects of lay judges and jurors, and of judicial secretaries. 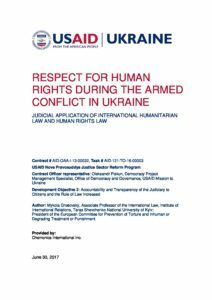 Mykola Granovsky, Associate Professor of the International Law at Taras Shevchenko National University of Kyiv, analyzed international humanitarian law application by national courts while considering cases related to conflict. 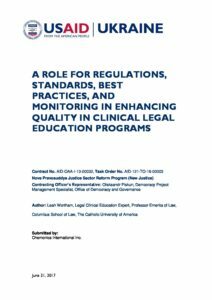 This report provides an assessment of the current state of legal clinical education in Ukraine through analysis of the existing regulations and standards governing legal clinics in comparison with the respective U.S. docuements and best practices. It also analyzes the role of the Association of Legal Clinics of Ukraine in promoting high quality legal clinical education. 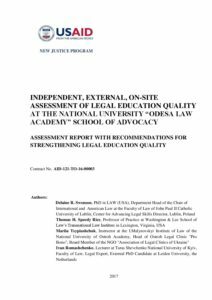 This is the Assessment Report with Recommendations for Strengthening Legal Education Quality following the Independent, External, On-site Assessment of Legal Education Quality at Odesa Law Academy School of Advocacy. New Justice’s team of two international and two local experts conducted the on-site assessment per the Odesa Law Academy administration’s request on March 13 – 17, 2017. New Justice publicly presented the Assessment Report to the Odesa Law Academy administrators, faculty, students, alumni and other stakeholders in Odesa on May 29, 2017. Pavol Zilincik reviewed the concept papers and draft law on establishment of the anti-corruption court in Ukraine in light of international standards and best practices, with special emphasis on the reflection of Slovak experience with the Specialized Criminal Court. 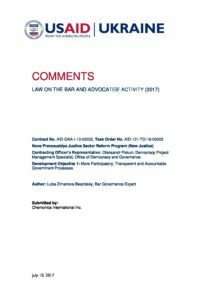 Luba Zimanova Beardsley developed a comprehensive analysis of the current legal framework for the bar and draft legislative amendments to ensure compliance with international and European standards and best practices for governing legal profession, including the organization and limits of self-governance bodies, guarantees of due process during disciplinary procedures, attorney-client privilege guarantees, and professional responsibility and ethics. New Justice expert Robert A. Hawley presented the US experience in governing the legal profession in line with the international standards based on the best practices of the Califormia Bar. 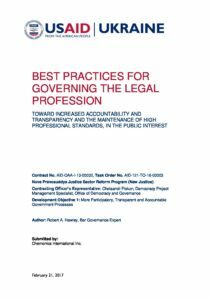 According to Mr. Hawley, the main aim of the self-governance of the bar is to improve accountability and transparency and the maintenance of high professional standards, in the public interest. 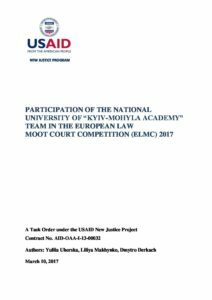 Report includes Lessons Learned and Participation of the Kyiv-Mohyla Law School Team in the European Law Moot Court Competition held on February 23 – 25 in Gothenburg, Sweden.